Standing out even on an avenue as spectacular as Central Park West, the dramatic edifice that is The Braender Condominium attracts attention with its undulating façade and ornate central archway. Built in 1902, the 10-story high-rise has a sizable entrance court, with a striking 11-scalloped arch and imposing double columns. Four large curved bays open onto the street. The renovated building has maintained many original prewar details, merging old world historical grace with new world conveniences and luxuries. The sweeping, elegant lobby is paneled in white marble with gray-blue veining, set off by marble with swirls of gray and brown. 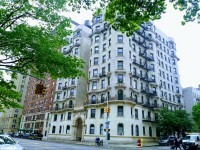 Many of the apartments boast an abundance of natural light, lovely hardwood floors, and other charming turn-of-the-century features, as well as unobstructed views of Central Park. Located on Central Park West between 101st and 102nd Streets, and directly across the street from the park, The Braender Condominium offers unparalleled views of the park in all its glory, as well as easy access to its 843 idyllically-landscaped acres. Shopping (including a Whole Foods Market), restaurants and cafés with a blend of neighborhood and fine dining are all nearby on Columbus, Amsterdam and Broadway. Finally, you’re just a block away from the A, B, and C trains at 103rd Street and Central Park West. Residents of The Braender Condominium enjoy a full-time doorman, two elevators, a package room, private storage units, a central laundry room, and many original details.